Ever since I was a little girl, I loved old things. I enjoyed looking at a vintage item and wondering about it's history. Now, I tend to look for things to incorporate into my small, but growing collections while still thinking about the previous owners. A few weeks ago, we happened to be running errands not too far from my favorite thrift shop. I was pleased when my four year-old asked to go into what she calls the "bird store". Fitting name since there's a bird on the sign. We didn't have anything else planned for the day, so we parked the car and ventured into the shops for some browsing. Grace enjoys testing each chair and sofa in the furniture department, but her patience wears off by the time Joe gets to the hardware department. By this time she is so excited, she just can't wait to get to the toy section! I love that she can be equally pleased with a 99 cent thrift shop find as she would be with a shopping spree at that major toy retailer. I thought that I took pictures of all of our finds from that day, but when looking back at my camera I noticed I only took a couple photos of some pots and pans we picked up that day. So, I'll have to come back another time to share the rest of our second-hand treasures with you. 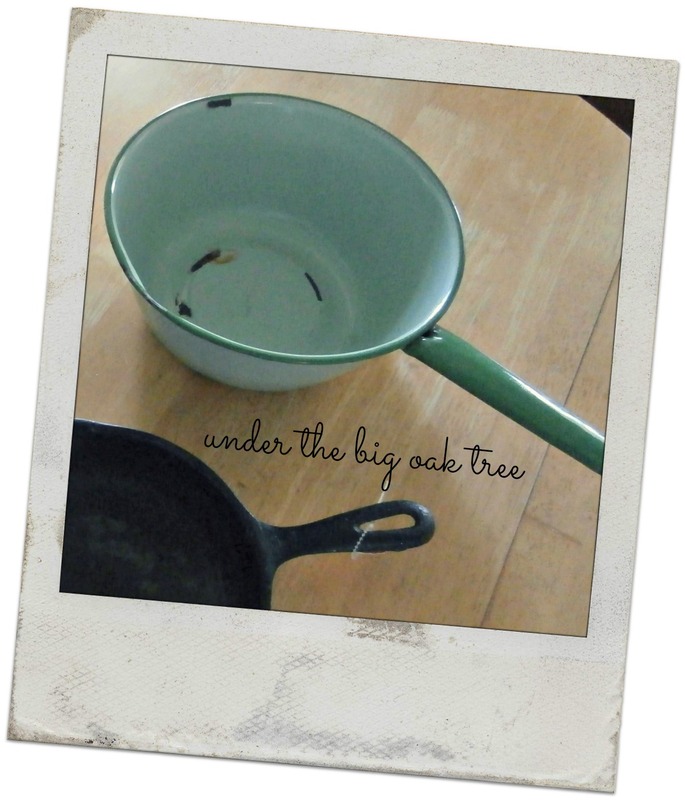 But for now, take a peek at 3 of the items we brought home with us that day! The top two pots were my picks for the day! I have a difficult time resisting old enamel kitchen items. Joe has wanted a cast iron skillet for some time. This one needs a little cleaning up. I'll leave that up to him! 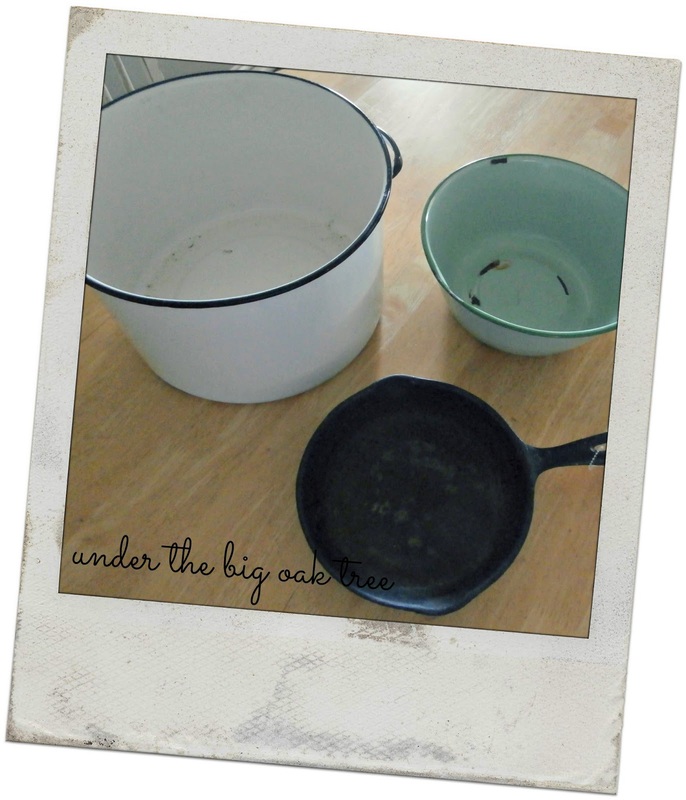 I love that large stock pot! it sure would make for a great photo prop! I don't usually purchase two enamel pieces in one outing. We live in a small house, so I really try not to go overboard with collecting. I usually limit my purchases to ONE collectible item. Especially, when it's not half price day! when I came across this green pot. when he spotted both items in our cart! or this color (that green pot) yet! and cook up something delicious! I'll have to pull a few more items out of the cupboards, so I can snap some photos to share with you next week! The pots are adorable! Wish I had found them! Have a great week! 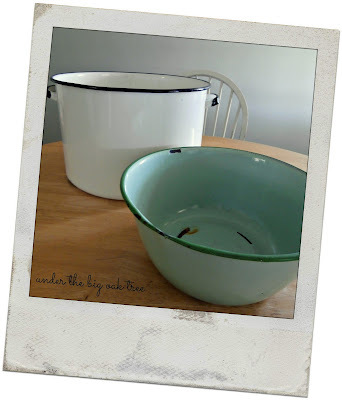 I love enamel items, too! I have several ladles and spoons that belonged to my mother. My sister has the big pots! 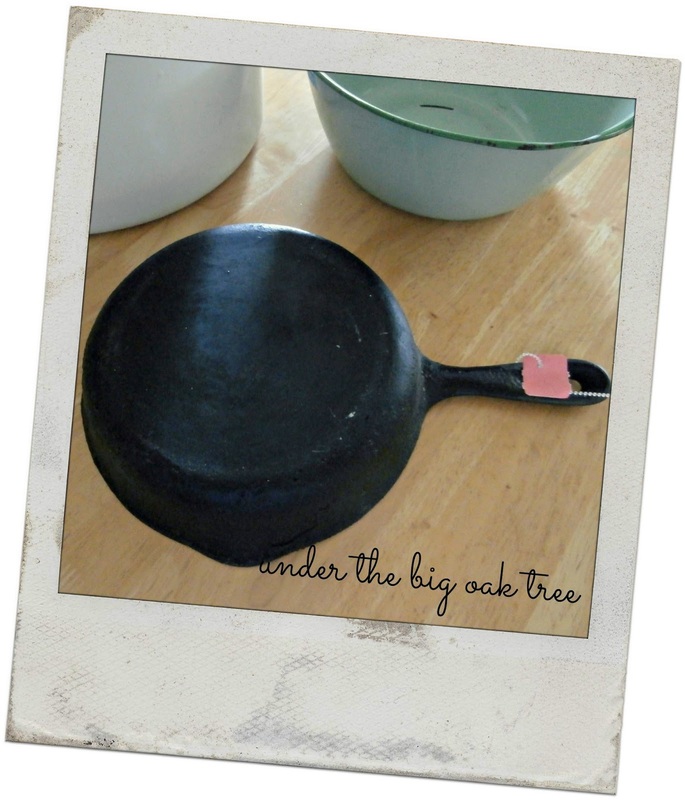 Your finds are great but nothing beats an old iron skillet. I still have my mothers.